The story of Amyr Klink in “ENDLESS SEA”. A riveting excerpt from a solo adventurer’s tale of his Antarctic circumnavigation. A riveting excerpt from a solo adventurer’s tale of his Antarctic circumnavigation. These images are from Endless Sea: Alone Around Antarctica as Far South as a Boat Can Sail, which is being released by Sheridan House this month. The staff of Yachting is proud to introduce our readers to Amyr Klink, a man who needs no introduction in his native Brazil, where he is a legendary sailor and bestselling author. Just five days to complete my dream plan, 360-degrees. Into the wind, Paratii climbs up the minutes of latitude with ease. From here forward, though the latitudes are downsizing, the frequency of icebergs pouring out of the mouth of the Weddell Sea could actually increase. I mostly don’t want to make any mistakes. I call Hermann in Brazil and we agree on a new frequency for radio contacts. The weather forecast I receive is not bad. The problem is that, though I am down to the last few days before arriving at the finish line and desperately anxious to enter Grytviken, there is still a stretch of treacherous sailing to do. I am not worried about bad weather, but only with the direction of the wind and I wish to avoid adventures of any kind. In the early hours of Mardi Gras, February 16, 1998 I cross longitude 47°30’W, the same longitude I crossed on November 9 of last year. Although Paratii has now crossed all 360 meridians of the earth, she did so in different latitudes; last year at 40°N, this year at 56°S. The route I plotted on Chart No. 4009 was shaped like a spiral, not a circle. I still need to close out the circle. The next forecast I receive is dry and objective: February 18, 12:00 Zulu, 50-knots winds. “Please be westerly, at least,” I mutter. It doesn’t take long for the wind to pick up: forty-knots, northwesterly. The sails are reduced to the last reef to avoid any drama. The pressure stabilizes at 986 millibars. “I’ve seen worse,” I murmur to myself. Unperturbed, Paratii holds firmly on her course toward South Georgia. At 6:05 p.m. the largest of the Willis Islands appears on the radar screen, nineteen miles to the south. No visibility. Damn it! I wanted to beat the darkness. Oh, if I only could! But I can’t. I will have to trust the radar, keep my eyes glued on the bow every second, and use all the resources and skills I have at my disposal to avoid committing a stupid error this late in the game, even if it means standing on the bow, freezing like a figurehead with a flashlight in my hand. Say! Where is that 1,000-candle flashlight, anyway? I go down to get it. I know I will spot large icebergs at some point, either on radar or with the 1,000-candle flashlight. A large number of bergs, sometimes tabular ones, come from the Weddell Sea and run aground around the islands. What worries me most are the small ones that come from the island itself. There are certainly thousands of them blowing out of the bays at that very moment. And there are thirteen bays before we reach Cumberland East and, finally, Grytviken. That means dozens of glaciers are putting invisible obstacles into our path. Ahead of the bow lay some sixty-miles of blind sailing through nighttime and rough seas before I can reach the bay I am shooting for. The waves and wind increase, as does the ache in my belly, to sight land, not to make any mistakes in my approach. Before darkness falls upon us completely I feel anxious, and go below to the engineroom to check on the driveshaft. I might need the engine in the fjord. Everything is in order. As I am leaving the workshop, I remember that under the tool drawers, beneath the floor, is one of the Christmas champagne bottles. “You managed to escape Christmas, New Year’s, and even Dorian Bay, but you’re not going to escape anymore,” I think. I don’t know what triggers that thought. Of course, I am not going to touch that bottle now, but later, after I have arrived. But my intentions alone bring an immediate response. Suddenly, I am slammed against the workshop wall. Four of the eight tool drawers come unlatched from their cabinet. All the tools fly out of the drawers and stick to the ceiling, alongside floorboards-and the champagne. The impact-a strange lateral blow that makes the boat shake-causes the door to the engineroom to come unlatched and slam shut. The force of the slam knocks the door handle off and sends it flying into the nether gloom. I am now trapped inside. In the total darkness of that enclosed cubicle, with my belly against the wall, rollerblading on wrenches and tools of all sizes, some of which fell through the opening created by the engineroom door, I quickly grasp what is happening. Paratii has capsized, or at least been knocked down. And there is no one out there to take any recovery measures. I spend fifteen minutes in despair, trapped by the door, trying to find a wrench that matches the square nub protruding from what was once a door handle. In the darkness, desperate to get out, I can’t find anything. Something happened to the autopilot and the boat must have broached, burying the mast in the water. The strange shaking could only have been the mast breaking. My first thought is that I need to find my large cable cutters and cut away the stays to free the boat from its dragging mast. Then, I remember, Paratii no longer has stays. If we have been dismasted, there will be no stays to cut. And I just know we were dismasted. “Damn door, let me out!” I shout. The boat rights itself suddenly. When it does, the drawers, tools, champagne, and all hell slide along the wall back to the sole again. The bilge boards are out of place. There is no place to ground my feet other than in that slippery mess. With a calmness I cannot explain, I pry open the door. There is no water belowdecks, despite the companionway having been open. No water on the table. The radio and charts are dry. But the biggest surprise of all is out on deck: the mast is standing tall, both sails in place. Water is still gushing out of the boom. Incredibly, the autopilot managed to right the boat and get us back on course. We are once again surfing the waves as if nothing at all happened. Only the cockpit has water. The lines that normally filled the floor space of the cockpit are gone, now dragging behind the boat. Little by little I haul in all the lines and check everything. Blocks, sail slides, the windvane-nothing is missing. This is hard to believe. I do not stay outside for long, fearing that another wave could lay us over again. The diehard and efficient wind generator growls on, as if nothing happened, and the antenna is still in its place. I feel uneasy as I go down below and close the companionway hatch. I am exhausted. The lines dragging behind the boat have become soaked and heavy, but none of them snagged on anything. Not on the rudder, not on the propeller. It is not so much the weight of the lines that wear me out. No, this is mental exhaustion. Now I have to check everything below. No one comes through a wallop like that unscathed. At about 1:30 a.m., while checking my position, I notice I crossed my own starting line- the line I drew when arriving at South Georgia Island back in November. I have finally closed the circle. Now, yes, the 360 degrees around the earth have been traveled. A trip around the entire world. 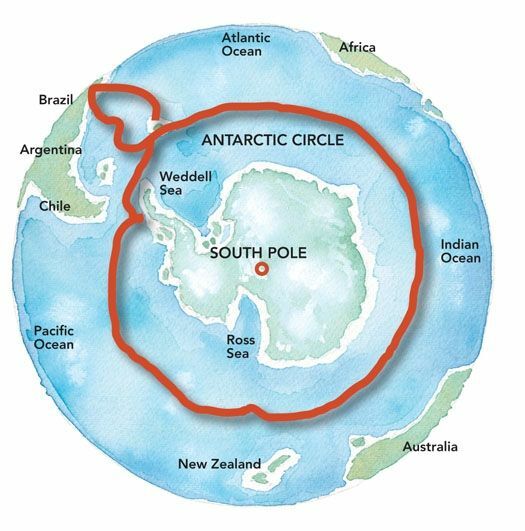 A circumnavigation around Antarctica, only to suffer a knockdown in the final minutes! Now all I need is to reach Grytviken. The Possession Bays, where Cook first came ashore, fall away off our stern starboard quarter. Just ahead is Fortune Glacier and Fortune Bay. The next large bay will be Stromness, followed by Cumberland-my bay. I’d better check the engine. I release the driveshaft brake, check the throttle and choke, and turn the key. As always, she starts right up. What a comforting old rumbling sound, so secure and reliable. Could it be air in the pump tubes? What could it be? I look at the chart. I am not about to tack my way into the bay, risking a head-on collision with glaciers. I am also not about to stay out here and wait. I give myself a 90-minute deadline. If I still cannot identify and solve the problem, if the engine still won’t start after 90 minutes of effort, then I will give up on South Georgia and head straight up for Brazil. I won’t, under any circumstances, ruin the voyage by risking an approach in high winds and darkness. We are making nine or ten knots. In about 90 minutes I will be at the mouth of the bay, and will have to decide whether to enter or head back out to sea, north to Brazil. I open a box of fresh batteries, turn on the headlamp, and tighten the elastic around my head. I return to the engine, adjust the wooden stool over the driveshaft, and take a good look at my hands. I am able to turn the engine over manually, which tells me it is not water contamination. What could it be, then? I decide to bleed the fuel lines. This calls for three different wrenches, a 1⁄4-, a 9⁄16-, and a 5⁄8-inch. I lean my body out of the engineroom and into the workshop. Mother of God, all the wrenches, which have always been well organized, never out of place for a single day on this trip, now look like one big mess of chrome vanadium. Many of them made their way into the bilges or ended up in other more mysterious places- we’re talking over 200 wrenches. I begin to look for the wrenches I need while sorting out the whole mess. I find some metric wrenches. The English ones are not to be found. Minutes are racing by. With my fingers, I work my way to the last filter along the line before the injector pump, and I find the plastic spigot. I turn the spigot, put some of the diesel between my fingers, and taste it. It isn’t pure fuel. It is salty! Phew! I spit it out. Of course! Salt water must have come in through the cockpit vent. I go to the day tank, turn the faucet, and take a sip. This water is salty and tastes like diesel. Delicious! I know what the problem is. Now I need to fix it. I drain all reservoirs, the daily tank, and the filter, any spot that might have retained water. Air has gotten into the lines. I bleed the air until the last bubbles. Nervously, I turn the ignition. It won’t start. “Be calm, be calm!” I tell myself. Nothing, nothing in the world could make me happier than to hear the engine once again. I can hardly believe it. I rev it up to 2200, 2400 rpm-just for the pleasure of having fixed the problem. When I return the keys to the workshop, I look at my sixty-dollar G-shock watch. Because of an oversight in my preparation, this is the only chronometer I have on board. I have 25 minutes left before the 90- minute deadline expires. I round Point Larson and head southward. The Nordenskjold Glacier appears at the far end of the fjord. Incredibly, the weather clears. A sliver of sun escapes from the east, shining on the island’s snowy peaks and coastlines. It is a dream come true.